Having a child is the most important part of the union between a man and woman. For them, sharing their love for each other to their children is the best feeling in the world. This is whay many couples are always anticipating the time when their doctor inform them that they are going to have a baby soon. However, sometimes getting pregnant is not as easy as most people think. In some cases, the wife or husband suffers from infertility problems. Infertility is a medical condition that prevents couples to conceive. What causes this problem? How to avoid it? Let’s take a look. Infertility is a condition that is suffered by millions of people around the world. It may be severe, but the condition can be treated. The person must find out why he or she became infertile in the first place. As women get older, fewer eggs are produced. This also means that getting pregnant can be a challenge. 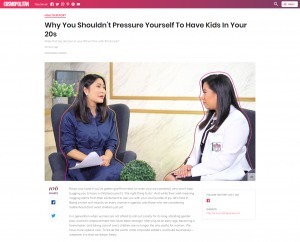 Women who work at a young age may have problems conceiving once they reach 30. As important a career may be, it is also essential to prioritize one’s future. Would you rather have a child or a great career? Taking birth control pills can harm the reproductive system. Continuous use of these over-the-counter medications can lead to hormonal imbalance in the body, which may lead to infertility. This does not mean that you should avoid taking these pills. Instead, it should be taken in moderation, or only as advised by a medical professional. You are what you eat. Foods with too many preservatives can have a negative effect on your reproductive system. Apart from that, unhealthy food can cause other health issues like high cholesterol, diabetes and many more. You must be healthy in order to have a pregnancy without complications, but it is at your best interest to stay in shape to live longer. Always keep track of your Body Mass Index or BMI. Being overweight can also cause fertility problems. Is your body ready for pregnancy? It might be a reason why you are having difficulty to getting pregnant. For instance, bigger women have higher chances to get pregnant than a smaller woman. You also need to consider your family history since genetics play a big role with regard to pregnancy. The best treatment is always the pre-emptive one. Consult your OB-Gyne and have yourself examined regularly. Regular check-ups will not guarantee you immunity over fertility problems, but your doctor can advise you on how to keep yourself healthy and ready for pregnancy.